As handmade artefacts my contemporary mirrors have a distinctly different look & appeal from those all too similar mirrors you see on the high street so if want something a little bit more special to enhance your home then you've come to the right place! Your home should reflect your personality and be filled with things that you simply love, which is why every mirror I create is designed to add a unique flavour to your home and bring a smile to your face every time you look at it. Browse the Triangular profile mirrors below or any of my Contemporary Wall Mirrors and see what you think. The angular appearance of my triangular profile mirrors make a bold statement making them ideal to take pride of place in any room in your home. 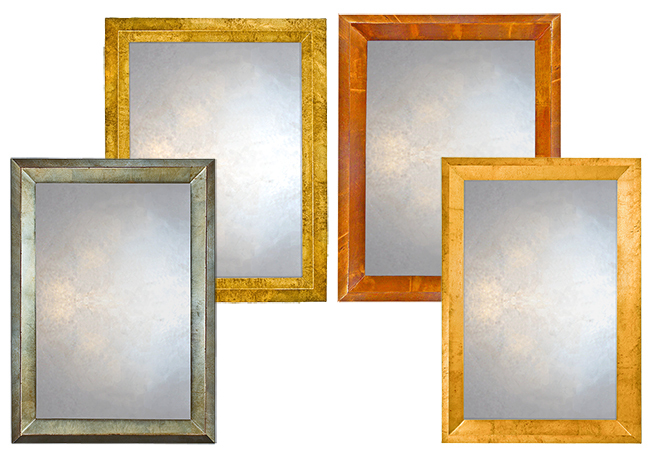 Available in a wide range of styles, finishes and sizes, my mirrors will enhance any home environment, whether you live in a modern or traditional property.Perfect for hanging over a mantle, adding a touch of opulence to your bedroom or a practical yet stylish addition in your bathroom, my handmade triangular profile mirrors are finished with my stunning gilded finishes. Reminiscent of a beautiful butterfly's wing, my unique finishes and simple geometric forms are lovingly designed to catch the light and delight the eye. Forget the high street and the throwaway generation. My competitively priced mirrors are an investment you can enjoy for many years to come and thanks to my bespoke service, I can create a mirror just for you, so you'll never see the same thing in someone else's home. My mirrors can be customised to exactly match your requirements, so whatever you choose, I guarantee that you won't be disappointed. Order your mirror today or click here to get in touch and I can talk you through your requirements or answer any questions you have.